Unclog Artery | Healthy Diet to Cleanse Arteries - FOH Inc.
We now know, although not everybody agrees, that atherosclerosis can resolve if we quit feeding it with the meat-, dairy-, and sugar-based Western Diet, such as the S.A.D. (Standard American Diet). If you were to list the factors that increase the risk of heart disease and stroke - just about any illness - this diet has them all. During the nutritional arterial cleansing, then, it is necessary to change eating habits and preferences by paying more attention to the foods you eat, namely their type, amount, and quality. red meat, especially fried, changing it to broiled or roasted poultry (turkey, chicken), preferably free-range. dark green leafy vegetables. Green leafy vegetables also contain compounds known as thylakoids that trigger satiety signals in humans to help people regulate food intake, prevent weight gain, and promote weight loss. PLEASE NOTE: The unspoken cultural assumption that persists today is that a plant-based diet is inferior and deficient in protein and contributes to a weakened body. The good news is that the growing body of nutritional research is illuminating the fallacy of this cultural myth. Of course, you'll need to eat a lot more broccoli and spinach to get the same amount of calories that you do from the meat. Multiple studies have shown that if you are meeting your caloric needs through plant-based nutrition, you will satisfy your body's protein requirements. Nutritional research has also discovered that plant-based protein from a wide variety of sources adequately supplies all the essential amino acids required for a healthy body. It is not necessary to consume a "complete" protein at every meal. The body’s innate intelligence utilizes the protein from multiple meals to provide the necessary building blocks. In addition, every bite of plant-based protein offers the extra health benefits of fiber, antioxidants, phytochemicals, vitamins and minerals. How can you add more plant-based protein to your diet? By simply eating more plants. Beans (27% protein) lentils (36%), chickpeas (33%), peas (30%), and kale (22%) provide the greatest opportunity to acquire micronutrients packaged with protein. Practical solutions to add more of these include adding beans/legumes to salads, stews and soups. Use higher protein vegetables like spinach, kale, lentils, broccoli, beans and peas in each meal or recipe. Sugar is harmful to human health! Unfortunately, many people are actually addicted to sugar. This common phenomenon often is referred to as an intense desire to consume simple sugars, or a carbohydrate or sugar craving. Ironically, sugar craving is believed to occur as a result of rapid rises and subsequent rapid falls in blood sugar which are caused by -- high consumption of carbohydrates. It should be noted that carbohydrate (sugar) cravings may be also caused by metabolic and nervous system ailments such as hypoglycemia, obesity, bulimia, depression, seasonal affective disorder (SAD) and stress, especially due to worry, injury or disease. Other possible causes of sugar (carbohydrate) cravings also include pre-menstrual syndrome (PMS) and candidiasis. In order to free yourself of the physical addiction, complete avoidance of all sugar is necessary as only total abstinence can resolve the biochemical addiction. During this transition, however, it is very important to eat every two-three hours to avoid symptoms of hypoglycemia. Otherwise, if you do not eat every 2-3 hours, your blood sugar may "crash" and you will feel horrible. Eating this way for several days (up to several weeks) is absolutely necessary! Sugar is also a source of excess calories which are being turned into fat - usually, triglycerides, so the fat levels in the blood go up leading to... atherosclerosis. One of the simplest and most profound health improvements you can make is to eliminate soda from your diet. The following foods are so bad for your body that there is no any reason to eat them. Not only do they have zero nutritional value, but they also give your body quite a dose of toxins. full of white flour (in most varieties). If you are a "popaholic," or if you are in the habit of drinking soft drinks, you jeopardize your arterial health. filled with harmful artificial sweeteners like aspartame - NutraSweet, Equal (in the "diet" varieties). Especially threatening is the consumption of soft drinks among children. Unfortunately, schools often make marketing deals with leading soft drink companies in exchange for their students’ health (most school hallways are lined with soda-filled vending machines!). According to the US Department of Agriculture (USDA), most teenage males consume an average of 34 teaspoons (136 grams) of sugar per day, mostly from the soft drinks. A study in an issue of The Journal of Clinical Endocrinology and Metabolism reveals how even moderate consumption of soft drinks causes “a rapid and prolonged elevation of plasma (blood) triglycerides,” also having a profound impact on hormonal balance, hunger, calorie intake, obesity and the risk of developing type 2 diabetes (TJCEM, 2004:Vol. 89, No. 6). high in acrylamide (up to 82 mcg per serving), a potent cancer-causing chemical formed as a result of unknown chemical reactions during high-temperature frying or baking. Nutritionally speaking, consuming foods that are fried in vegetable oils contributes to aging, clotting, inflammation, cancer and weight gain. One French fry is worse for your health than... one cigarette, so you may want to consider this before you order your next ‘Biggie’ order. high carcinogenic acrylamide (up to 25 mcg per serving). contaminated with parasites and resistant viruses (they may not even be killed with high heat). Eating these scavenger animals gives you with every bite a quadruple dose of toxins. Healthy living can reduce yur chance of heart disease (heart attacks, congestive heart failure, stroke) by over 80 per cent. Re-educating and reprogramming your dietary habits is not actually hard to do - if you do it right. One good way to do that is to make your new food preferences delicious, and the experience fun, although this may require some preplanning. In your journey to a better health, there are quite a few food types to favour. As for beverages, drink mainly water. Among meats, fish is best, especially "safe fish," such as summer flounder, wild Alaskan salmon, Arctic char, croaker, sardines, haddock, and tilapia . Then, dark green vegetables. Especially, the cruciferous vegetables (broccoli, cauliflower, collard greens, kale, mustard greens, turnip greens, Brussels sprouts) are foods to be favoured. The other, so-called "cooking greens" - i.e. not cruciferous - include beet greens, dandelion greens, spinach, and Swiss chard. Are raw foods more nutritious than cooked foods? In general, yes, moderately so, as far as vitamins are concerned. However, the distinction between raw and cooked (but not "overcooked"!) foods is probably not worth making. The goal of this journey to a better health is to devise each day's food intake so as to optimize nutrition and minimize calories from carbohydrates - grains, legumes, starches and, of course, sugars. There can be "off" days when you eat something from your old habits, but these should gradually be decreased until only about every tenth day is an "off" day at home. Eating out should not be a major problem - do as you like. No fancy desserts, however, except, if you must, on the "off" day or when dining out. In general, if you eat out often, you must be somewhat restrictive. But when dining out, concentrate mainly on the quality of the diet. For example, don't eat the white bread and butter most restaurant put on the table for you to nibble while you await the main course. Either don't choose a high-fat meat (roast duck, pork, or the like). Look on the menu for items cooked without added fat: steamed, cooked in own juice, broiled, roasted, or poached would be okay. Avoid items sauteed, fried, braised, creamed, escalloped, pickled, or smoked. In other words, concentrate on switching toward the highest possible quality of food. You will find it far easier to limit your calories if the quality is high - until you will become accustomed to a better quality diet. Try your best to adapt to such a diet, or something like it. And don't give up too easily. Here are the optimal dietary guidelines that you should give serious consideration. At first, they seem hard to follow. However, you do not have to make yourself a social outcast with most of your family and friends, by following all recommendations to the letter. Sugar (in ALL forms) - limiting sugar is CRITICAL!!! * Aspartame - the technical name for the brand names, NutraSweet, Equal, Spoonful, and Equal-Measure - is the common food additive found in thousands of products such as diet soda, yogurt, and over-the-counter medicines. However, this sugar substitute – in fact, a chemical poison (neurotoxin) - should never been approved for consumption as it poses a public health threat. Aspartame accounts for over 75 percent of the adverse reactions to food additives reported to the US FDA. A few of the 90 (!) different documented symptoms caused by the components of aspartame include: headaches/migraines, dizziness, seizures, nausea, numbness, muscle spasms, weight gain (it actually increases appetite! ), rashes, depression, fatigue, irritability, tachycardia, insomnia, vision problems, hearing loss, heart palpitations, breathing difficulties, anxiety attacks, slurred speech, loss of taste, tinnitus, vertigo, memory loss, and joint pain. ** Sucralose - a relatively new artificial sweetener (high-intensity sugar substitute; 50% sweeter than aspartame - but less toxic than aspartame), sold under the name Splenda™. It is non-caloric and about 600 times sweeter than sucrose (white table sugar), alredy used in a variety of products (in the United States, approved for the use in 15 food and beferage categories). However, sucralose is NOT proven safe; it does NOT provide any benefit to the public (only for the corporations making and using sucralose); it does NOT help with weight loss (on the contrary: it my stimulate appetite); it has NOT been shown to be safe for the environment, and, finaly, there are NO long-term (12-24 months) human studies on sucralose (similar to several years ago for aspartame). Its regular use may contribute to serious chronic immunological or neurological disorders. Summary: The greener, the better. Once again, green leafy vegetables also contain compounds known as thylakoids that trigger satiety signals in humans to help people regulate food intake, prevent weight gain, and promote weight loss. Only miso and tempeh (fermented soy), and soy sprouts are acceptable - available in a health food store. shredded unsweetened coconut (added to some of your meals to increase calories). It is far more important to stop your sugar before you stop smoking. If you try to do both at once you will most likely fail to do either. Eventually, everyone should stop smoking, but it should be done in an optimal sequence. All you need to do is to start implementing gradually the recommended dietary changes - and you will begin seeing miracles occur. Simply, do your best! And remember, only YOU can change the food you put in your body to release the wonderful healing power within you. Eating Plan: How Is Your Digestion? There is no question that healthier food choices will work for you. However, following any dietary recommendations is a challenge. Therefore, as a result, you may not be able to successfully carry out recommended dietary changes. However, if you really want to eat right for atherosclerosis, here's great news... The final ANSWER to your question: "What Am I Going To Eat?" EPA - short for eicosapentaenoic (EE-coe-suh-pent-uh-noy-ick) acid. The major obstacle to any change is the "hardening or narrowing of the attitude," or - in other words - psychosclerosis. It is usually rooted in our fear of change. Most probably, after so many years of being in a comfort zone (read: in love with your old dietary and lifestyle habits), you are ready to defend it against anything new or different. You will try to find any possible excuse to reject the need for a change. As for arterial cleansing, you may use all your intelligence to find fault with this concept which is very different from the typical medical treatment and, therefore, easy to refuse. Instead of dwelling on all the reasons why the nutritional arterial cleansing would NOT work for you, you will concentrate on why it would. It all starts with changing our thinking from "whether" to "how." If you begin to focus on "how" you are going to protect and improve your arterial health, you will stop considering whether it is possible or not. In this way, your entire attitude toward your old, more comfortable dietary and lifestyle habits will begin to change for the better. cut your dependence on medications and surgery. In other words, by overcoming psychosclerosis you will be able to overcome atherosclerosis with the nutritional arterial cleansing - supported by dietary and lifestyle changes - leading the way. What sets it apart from conventional medical methods is that the nutritional arterial cleansing - by keeping atherosclerotic plaques in solution - helps to emulsify and wash them away safely and gradually. In other words, the nutritional method does NOT pull away "chunks of plaque" that could plug up the arteries further downstream! 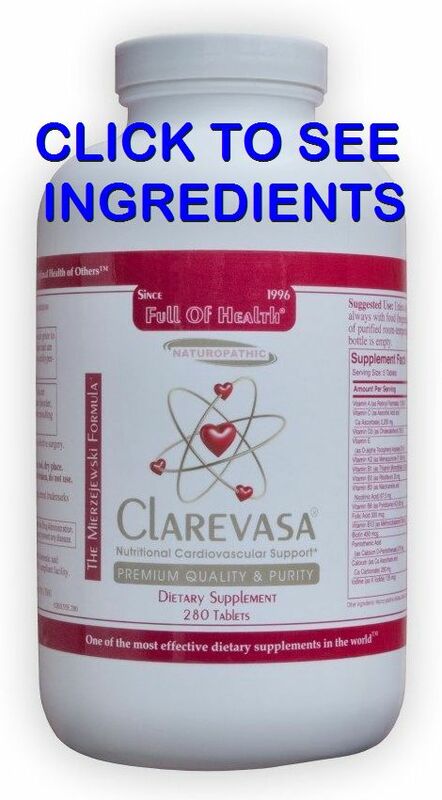 © 1998-2018 Reverse Atherosclerosis.com: Arterial Cleansing | Clarevasa Formula. All rights reserved worldwide. This document may not be copied in part or full without express written permission from the publisher. 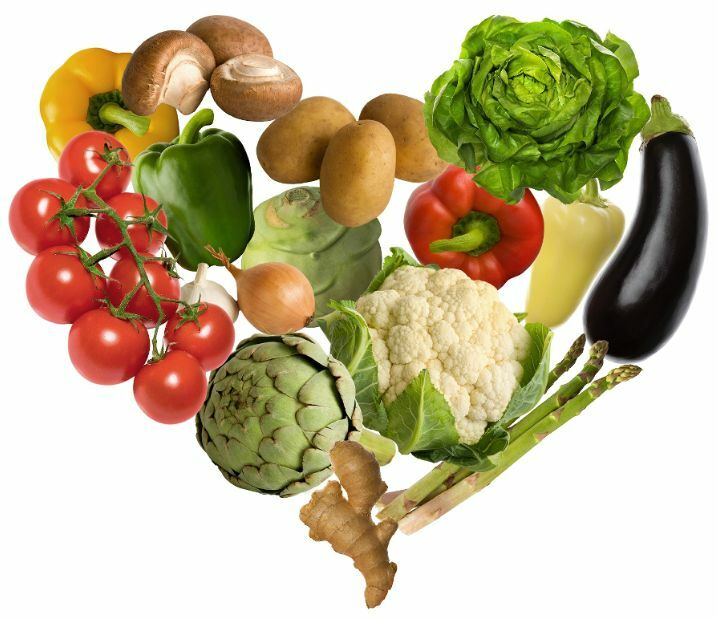 The information on atherosclerosis and nutrition provided herein is a general overview on this topic and may not apply to everyone, therefore, it should not be used for diagnosis or treatment of any medical condition. While reasonable effort has been made to ensure the accuracy of information on the nutritional arterial cleansing, Full of Health Inc. assumes no responsibility for errors or omissions, or for damages resulting from use of the information herein.